Each time I catch up on paper jewelry artists I've made a note to feature, I come across more. Mind you, I'm not complaining as I'm forever happy to round up photos of marvelous handmade examples! This time there's a mix of thought-provoking pieces and some that are simply light and fun. We'll mix them up and start with playful ones... balls and blocks, but with a definite artistic slant. 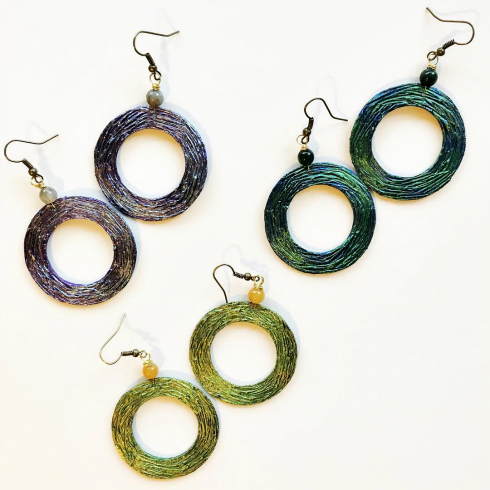 Marcella Stilo of Cartalana in Rome, Italy describes her eye-catching jewelry as having an eco-friendly soul... totally apt considering the pieces are composed of hand spun newspaper, advertising leaflets, and other discarded papers that are low weight and porous. Some pieces are enhanced with metallic paint, beads, or semi-precious stones; the paper is protected with a water-based coating. Cartalana also carries spindles and manuals in the shop so you can learn to spin junk mail. See the newest designs on Instagram and Facebook. 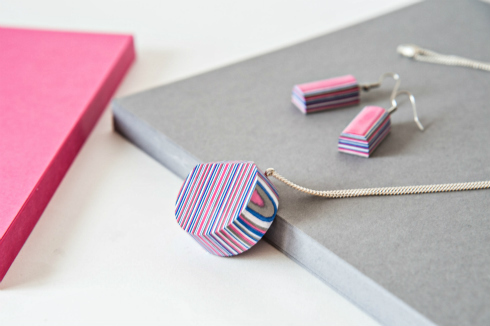 I love the geometric shapes of these layered paper pendants and earrings by Shiori Aiba in Berlin, Germany. She crafts each piece by hand using a process of compressing, cutting, and sanding that results in a soft, yet strong surface. Via Shiori's graduation project Paper Redressed at Central Saint Martins in London where she earned an MA in Material Futures, she explored traditional Japanese paper making and noted that it can bring appreciation to new and future crafts. Shiori Aiba is on Instagram and her Etsy shop is Studio Shiori Aiba. 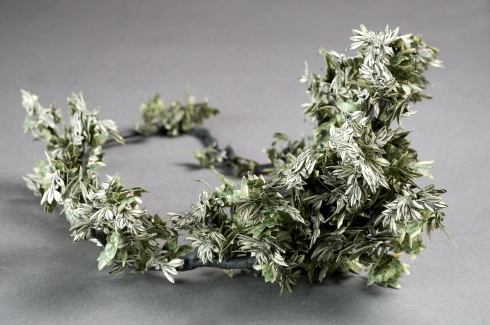 Undoubtedly the most unusual and painstaking paper jewelry I've come across in a long time is that made by New Orleans-based artist Lauren Tickle who works with U.S. dollars. She describes her Increasing Value collection as "an experiment in the concepts of value and adornment... These kaleidoscopes illuminate an alternative to money's intended function in our society. I leave the identifying words, letters, and numbers out of my work so the viewers can draw their own conclusions about its value." 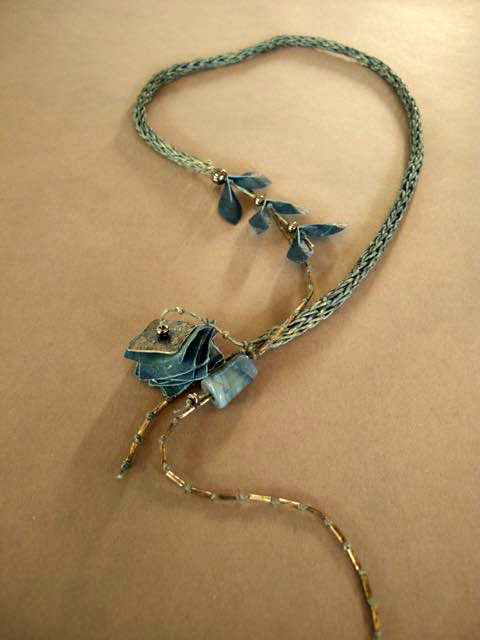 In addition to paper money, Lauren uses silver and monofilament to form the necklaces and brooches. 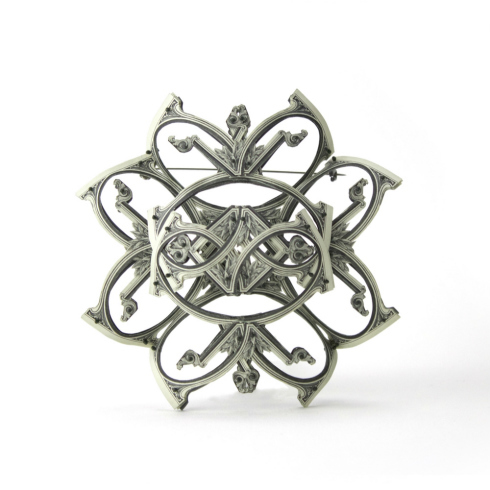 She has a BFA from Pratt Institute and an MFA in Jewelry and Metalsmithing from the Rhode Island School of Design. You'll find her on Instagram as lvtickle. 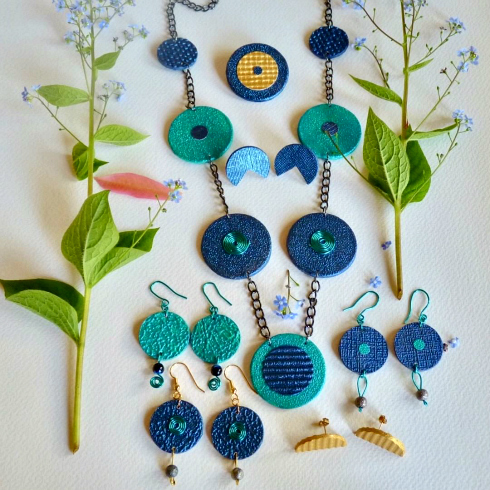 Lighthearted mixed media jewelry by Maureen Mitchell of MM Design also caught my eye on Instagram where she is @grafikmo. An artist and designer in Dunblane, Scotland, Maureen enjoys working with textures, colors, and layering effects. 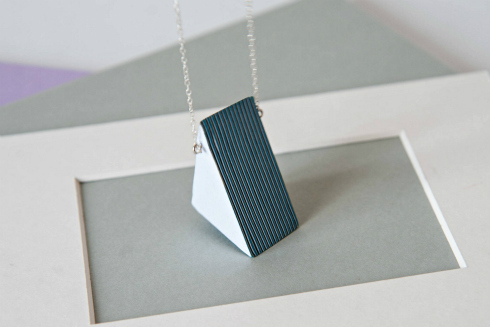 She has degrees from Edinburgh College of Art in Design, Jewellery & Silversmithing, and most recently, Graphic Design, which has led to the creation of prints, digital paintings, and collagraph prints. Maureen Mitchell Design's Etsy shop is Grafikmo. Jocelyn Chateauvert sculpts handmade paper into beautifully artistic objects. 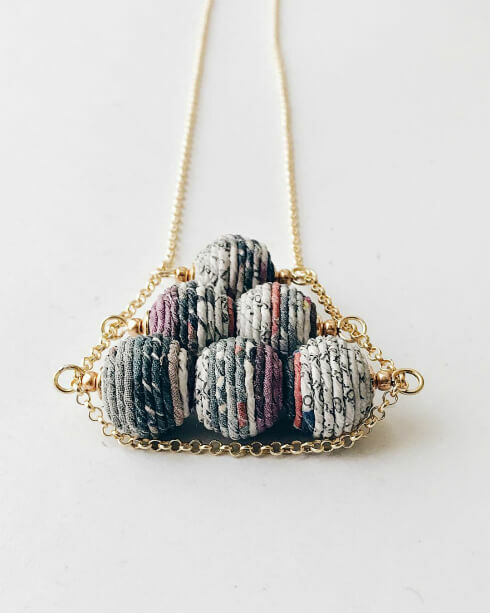 I highly recommend a visit to her site where you'll find much more than jewelry, but since that is today's topic, here are examples of the lovely necklaces she creates. 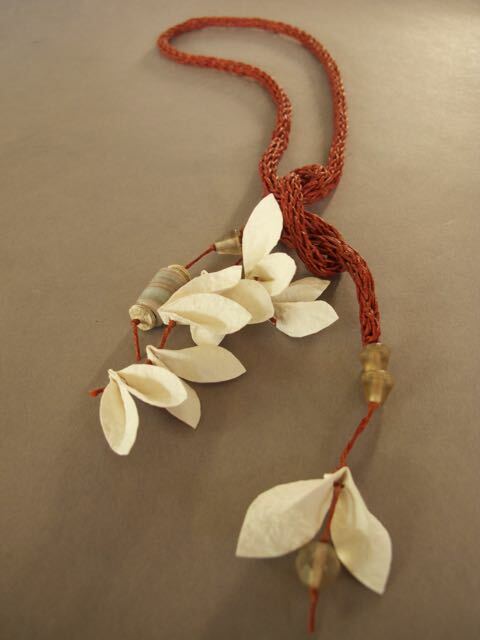 Small paper leaves are cut, shaped, strung, and accented with beads. 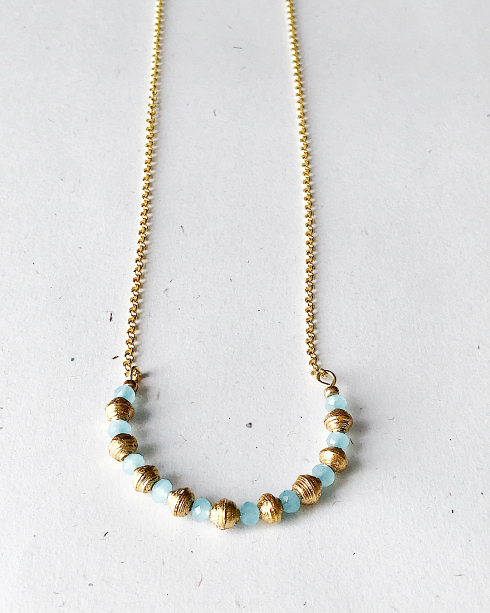 Each piece is bound to be commented upon when worn. Jocelyn Chateauvert is @paperwrangler on Instagram. 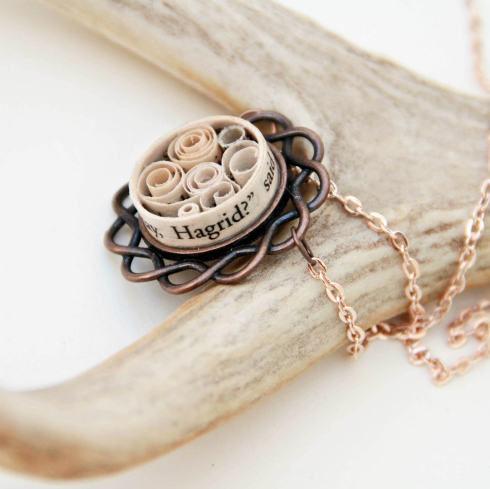 Fans of beloved books will appreciate the quilled paper jewelry that Mandie Shelton in Utah creates from page text. She coils rough-edged strips that go well with the rustic pendant base (above) to which they are glued. 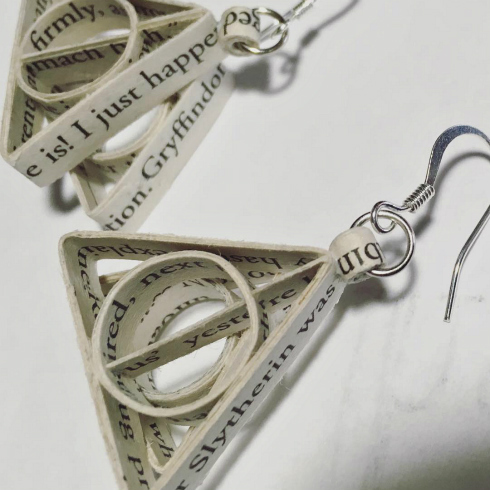 If you're enamored with Harry Potter, Game of Thrones, Twilight Saga among others, you'll enjoy a visit to Mandie's Etsy shop, Artsy Heartsy Boutique. On Instagram, she's @quillingmesoftlyart. 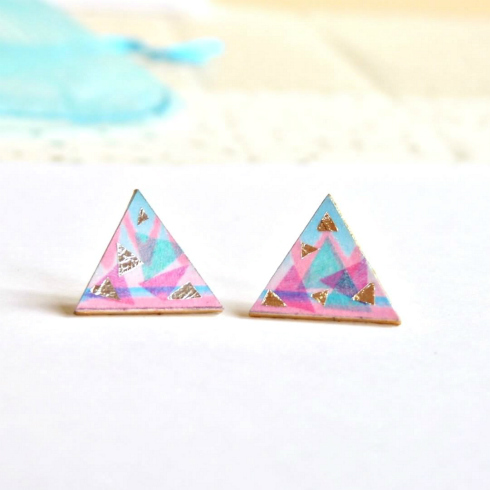 I spotted the boho-chic paper jewelry that Ana Sellas in Puerto Rico creates on Instagram where she is @wanderobjects. I'm looking forward to her website that is coming soon. 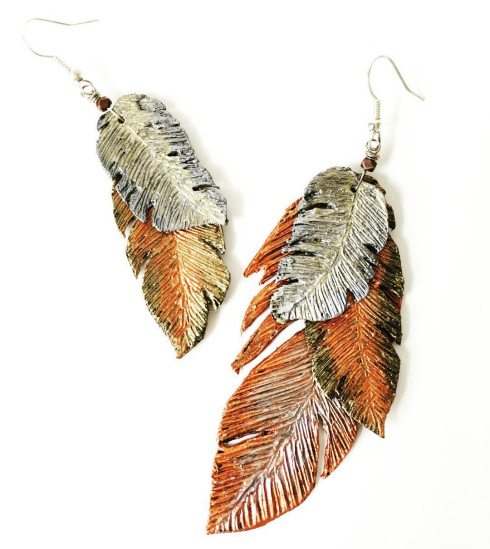 Most everyone loves feathers and the earthy metallic tones of these earrings that Ana handcrafted would be just right for autumn.